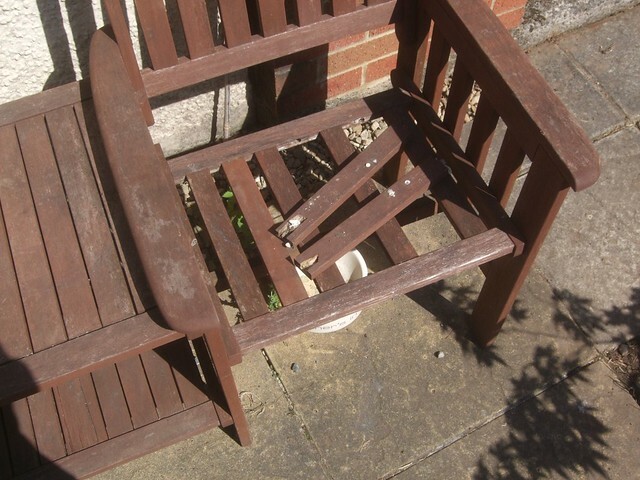 I think it first happened back in 2009 but, over a period of time, these slats have begun to ‘fall out’ from the one of the seats of this bench. 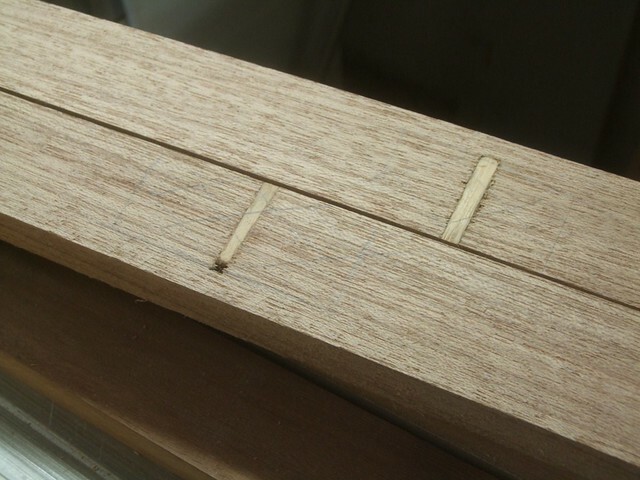 I have no idea why this is only happening on the one side… If you look very closely at the second slat from the left, you might be able to see that it looks slightly different to the rest – it’s actually a piece of iroko I used to replace the first ‘broken’ slat, back in 2009. 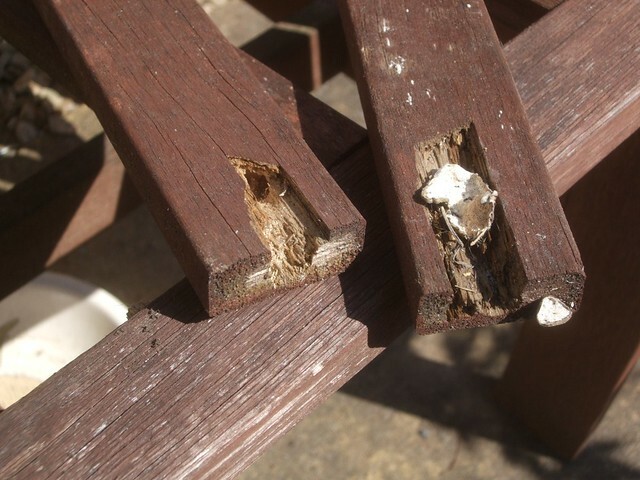 An even closer inspection reveals the possible cause of this all – water is clearly seeping its way in to the end-grain of these slats and wreaking havoc within the structure of this mysterious hardwood (in the photo above, you can even see some signs of fungus forming!). What you can no longer see are the beech dowels that were initially used to fix each slat to the front and rear rails of the seat. Beech is a perishable species, after all. But, in my opinion, there’s a fundamental flaw in the design, here – the fact that it allows water to collect and be absorbed by the end-grain of these slats. So, instead of simply replacing like-for-like with new slats (I’m not even sure how long that iroko will last in there, as I followed the manufacturer’s procedure in dowelling it in place… :oops:), I’ve decided that I will remake and replace the entire seat construction [note: I said seat, there – not chair!! ;-)]. After replacing a rotten back door last summer and salvaging what I could of the usable timber, I happened to have a stash of ‘red hardwood‘ in stock – which I’m now inclined to suggest could be afromosia; not iroko at all. 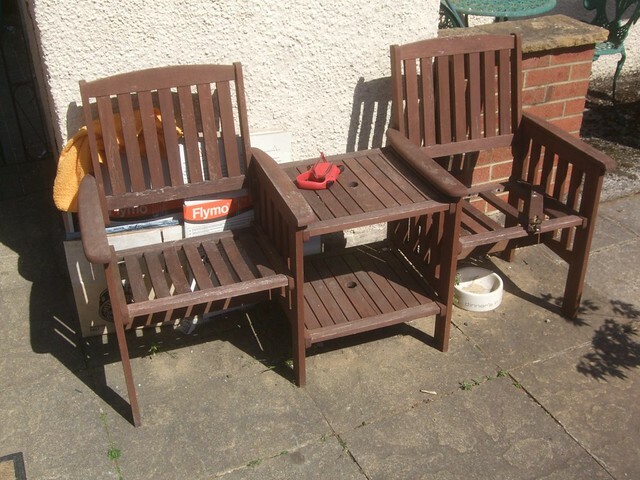 It’s fair to say that I was being highly optimistic in my hopes of salvaging enough material to give me two matching seats from what I had available… I only just had enough for this one replacement and, even then, I had to deal with a few beech dowels (!!!) that I wasn’t quite able to avoid with my initial machining and prep. work. 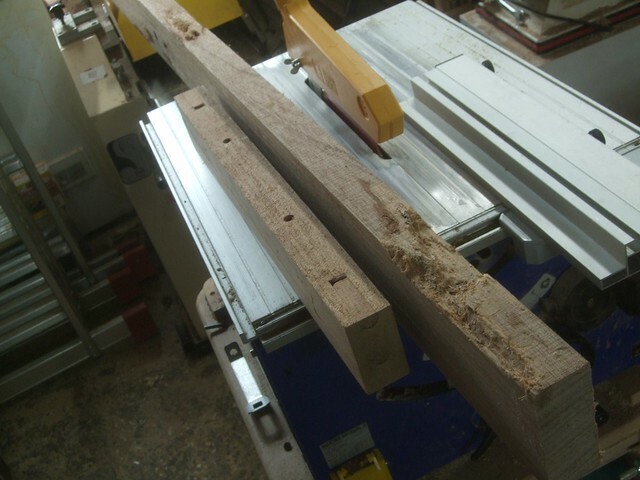 Bear in mind that I hadn’t prepared these strips at this stage; everything was still sawn to a rough thickness of 25mm. Even if I was to take these down to a finish 20mm in thickness, I wouldn’t have been able to remove both of these dowels in their entirety. 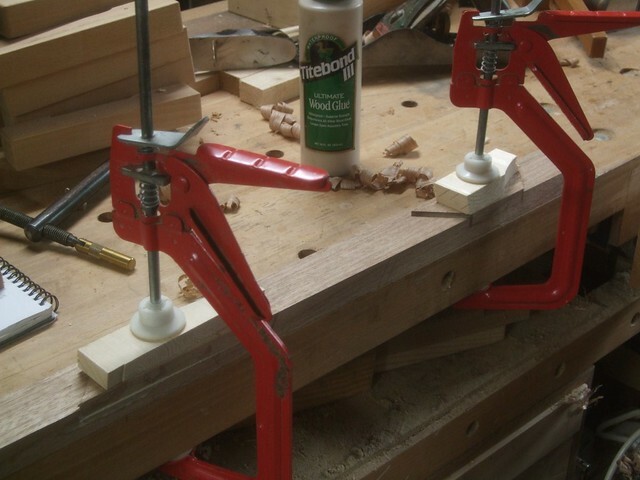 Instead, I came up with the idea of routing out a recess and filling that in with a splice of scrap wood (with matching grain), for each of the three dowels that were currently on show! If ever you’re going to attempt a repair or rescue job like this, cutting the ends of your filler piece at an angle always helps to disguise your work. A simple patch with 90° ends will stand out once the glue’s dried. Likewise, you’ll be able to spot in easily, in good light, from any number of angles. 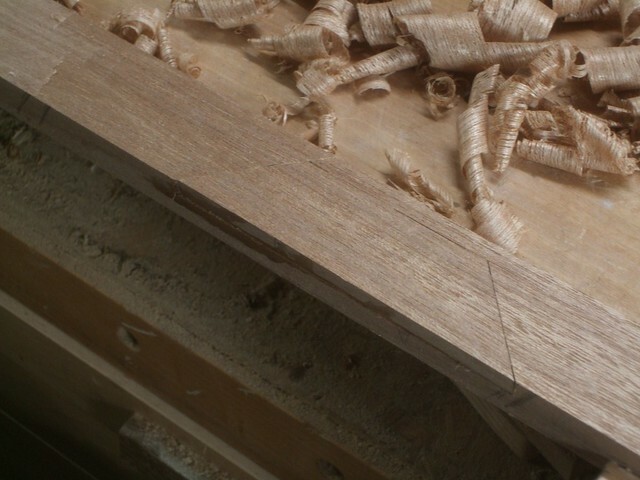 I started by carefully looking at my offcuts and selected an area of grain to match each of the three areas. Then, I roughly cut these out on my table saw, with the mitre guide set at 45°. 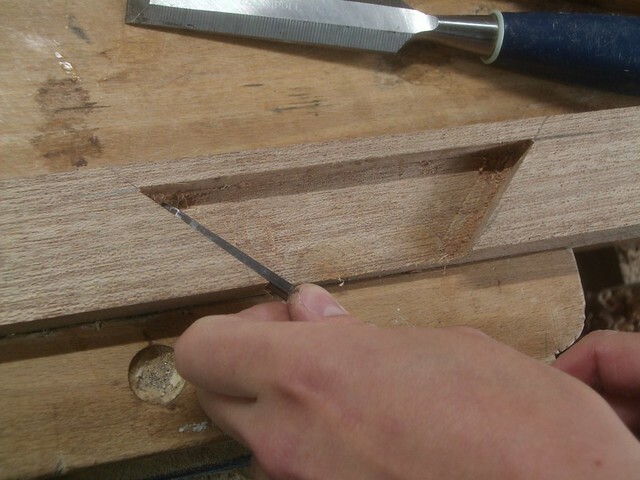 Then, I carefully set each piece in to position and scribed around it with a marking knife – in the photo above, I’ve mistakenly got the angles running 90° in the wrong direction, which made it very hard to chisel out the corners once I’d finished routing. 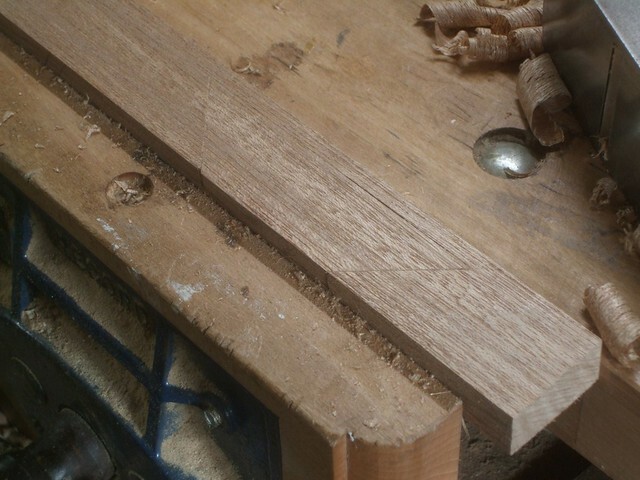 Yes, I then used my hand-held router with the side fence to remove the bulk of the waste, including the three dowels. Now that the adhesive has cured on all these repair joints, I can prepare these strips down to their finished dimensions – at which point, any further flaws in this patchy-business should reveal themselves for all to see!! This is a job that might call for some wood filler… Though, I’ll definitely have to ensure I put these two in upside-down! You certainly had your work cut out.